It’s only Wednesday but today is the last chance for the sprinters in this race. 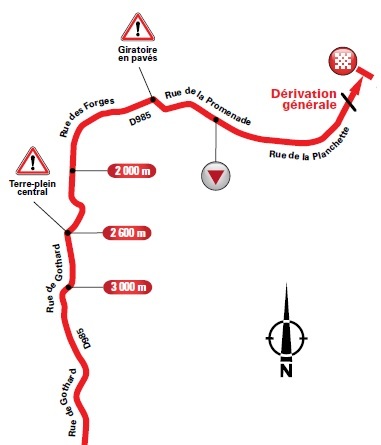 Look at the graphic above and once the climbs are out of the way there’s a nice run to the finish. But crunch the numbers and yesterday’s stage was for slated the punchers and climbers with 2,900 metres of vertical gain yet today features a comparable 2,600 metres. A sprinter must be able on the ascensions to be fresh for the finish. Still, the climbing is concentrated early and things get easier for the finish. This suggests a breakaway will go away on the early part of the stage and should be reeled in for the finish. Boring? Perhaps but the script is not written in advance and anything can happen. Even if you’re the sort who regrets seeing breakaways derailed by the sprint trains, note this is probably the last time it’ll happen in the race. The finish: after a cobbled roundabout 1300m from the finish the race bends past a scenic lake a gradual curve until 450 metres to go when it is straight to the line. This looks like a finish for the pure sprinters. Saxo Bank’s J-J Haedo quit the race yesterday meaning there are even fewer sprinters in the race, look to John Degenkolb (Argos Oil – Shimano), Nacer Bouhanni (FDJ – BigMat) and Gerald Ciolek (Omega Pharma-Quickstep). Plus Tony Gallopin of Radioshack-Nissan is hungry for a result; once seen as a sprinter he’s become more versatile. Local hero: former Dauphiné and Tour winner Bernard Thévenet was born 4km from the finish in a village called Le Guidon which translates as “The Handlebar”. Talk about destiny. He is the man who dethroned Eddy Merckx in 1975, the first to stop the Belgian in the Tour de France. An irregular rider he won the Tour again in 1977 but did not win many other races. Retired, he works for ASO during the summer is currently working on the Dauphiné. Weather: rain in the morning followed by a bit of sunshine later. Top temperatures of 20°C (68°F). There will be a 20km/h wind from the South-East, meaning a tailwind at times but for some moments a crosswind too. TV: the finish is expected between 4.00pm and 4.30pm Euro time but tune in at least half an hour before to watch the finish take shape. As ever cyclingfans.com and steephill.tv are the places to go to. Food: steak. Watch the race on TV and you are bound to see white cattle grazing in grassy pastures. These are Charolais. Bred for their succulent steaks and named after Charolles, a town just up the road from the finish. The cattle are naturally muscular and lean, if they could pedal they’d be classics specialists. The meat is sold across France, for example visit a Parisian café and the menu often won’t just say steak but bifteck charolais or Charolais steak. Language lesson: the finish is in La Clayette. For some reason it is not pronounced as you’d read it. Instead it’s “La Klet”. “The cattle are naturally muscular and lean, if they could pedal they’d be classics specialists”, ha ha good stuff. I think today looks like a sprint. What about Michael Matthews? Good pick too. He’s looked a bit off the pace so far so I was thinking the climbing might fry his legs. 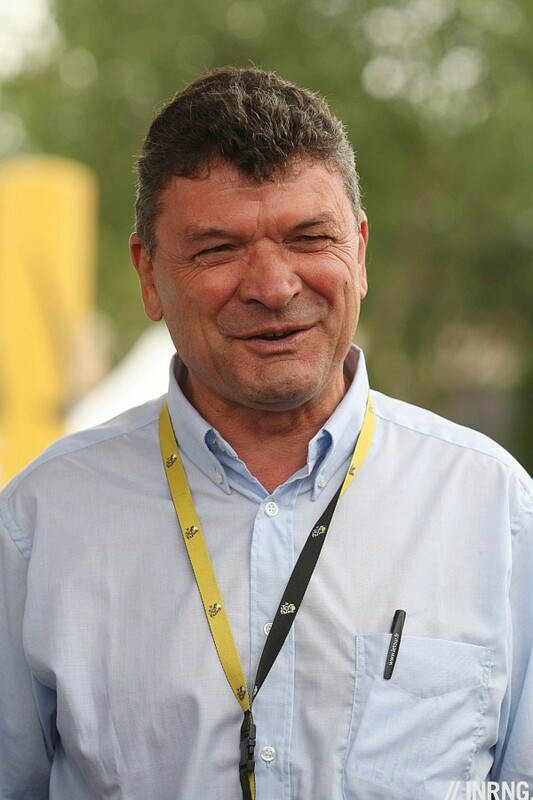 I remember reading about Thevenet as an amiable directeur sportif in Rough Ride. I love that area, its a great unspoiled part of France. Should make for great viewing. Thanks as always for the knowlwedgeable write-up! Re charollais cattle. They are not just common in this part of France; due to the qualities espoused above plus the fact that they can ‘finish’ (i.e. fatten intensively) very quickly you will see Charolais beef cattle or Charolais crossed with another breed all over France (a very common sight when I was cycling in Normandy a couple of years ago), and indeed across the world, including in the UK. Yes. And they even do artificial insemination of one breed with the Charolais, for example the hardy Limousin cattle live outdoors in the winter but can give birth to Charolais. As you’d expect this is disconcerting for traditionalists. For gourmets the Charolais, Limousin and Aubrac cattle are seen as the best beef in France. No need to import beef from Spain, eh? It’s interesting to see different perspectives on different breeds of beef cattle. There’s a school of thought in the UK that native-UK breeds such as Herefords and especially Aberdeen Angus produce the better beef when compared to Charolais etc because they don’t fatten up as intensively. To be honest, I think in general a lot more depends on the individual animal than the breed, but there’s no doubt it has a role to play (as well as being a function of national preferences!). As an aside, this is the first times I’ve commented, but it’s a great blog, thank you for the writing! I live on a street named Charolais and always wondered if the correct pronunciation includes or excludes the O? Here’s Charolles, the town in audio: http://www.forvo.com/word/charolles/#fr just add an “A” that rhymes with day at the end to to get Charol-ais. Starting to digress here, but the pronunciation of La Clayette is nothing like the confusion I have with some British placenames. Ignoring Wales for now (! ), I lived in Loughborough Junction in London: is it Low-borough like ‘though’, Luff-borough like ‘tough’, or Loff-borough like ‘trough’? (I know now that it’s Luff-borough, but I had to hear someone say it first). And then by contrast, what about Loughton in Milton Keynes? Of course in Australia we have suburbs and towns named for English ones, but the pronunciation has often become detached from the original. Berwick is ‘burr-wick’, Derby is ‘derby’, Launceston is ‘lawn-sess-ton’. Ahem…. seems you are straying into Les Vaches du Tour territory here INRNG…. Besides we all know that charolais are tough, so tough in fact some folks would rather eat the tractor that they taste off rather than the beef itself…. but them we Aussies are particular! Bring on Les Vaches … oops – Le Tour! Next post: Is Andy Schleck Off The Pace Or Right On Track?